April 3, 2019 (Investorideas.com Newswire) Sector expert Ron Struthers examines the market forces surrounding the drone delivery industry, and recommends a Canadian firm that is flying high. There is a new disruption on the way that will level off this graph in the next few years. We have come from "bricks and mortar" to "online" shopping, and the next wave of change I have dubbed "mobile shopping." Thanks to the higher power of smartphones, and better and higher speed networks, shoppers' mobile devices will allow them to experience both the online as well as bricks and mortar shopping experience at the same time. Shoppers will no longer have to sit in front of the computer screen at home to shop online. New companies that nobody has heard of will lead this charge—private companies like Heelo . Heelo has started to deploy its proximity marketing solutions and will likely be a top contender in this new category. Amazon acquired Kiva Systems for $775 million back in 2012 , and since then has been steadily investing in a robotic future. According to a September 2018 interview with Brad Porter, VP robotics at Amazon, there has been great progress: "Today we have more than 100,000 drive units deployed throughout our global fulfillment network. But many forget those aren't the only robots we have. We have deployed around 30 palletizer systems, and another popular robot you might see in our fulfillment centers is called RoboStow—a 6-ton robot that has the ability to move pallets of products up to 24 feet high and directly onto the larger drive units. " Amazon Prime Air is a conceptual drone-based delivery system that Amazon announced in 2013. From Amazon's website : "We're excited about Prime Air—a delivery system from Amazon designed to safely get packages to customers in 30 minutes or less using unmanned aerial vehicles, also called drones. Prime Air has great potential to enhance the services we already provide to millions of customers by providing rapid parcel delivery that will also increase the overall safety and efficiency of the transportation system." As of January 2019 , Amazon's latest update is that the company is working on a flight management system. "We will always prioritize safety first within our system," said Roth. "People both on the ground and in the air are the most important to protect. We're building a traffic management system with this as our guiding principle." I call Amazon Prime Air "hot air"because I believe the company took the wrong approach. Flying drones is not just another technology that you can develop in any way you see fit to meet your plans or dreams. This is what Amazon has done—announcing how t wants to use drones, but forgetting the most important aspect. Flying delivery drones falls under the mandate of controlled airspace run by the FAA . This is the most heavily regulated industry on the planet, as it can take years just to get in-flight eating utensils approved. Drones also have a performance-restricting flaw called battery life, which is a potential problem for the airborne devices. Amazon's debut drone features a 15-mile range . That's 7.5 miles there and the same back, so if you are not close to a distribution center, forget it. There are weight restrictions too, on what the drone can carry, and that is 5 pounds with Amazon's current drone. While Amazon is still working on a Flight Management System. TAKOF already has a working flight system (FLYTE) that encompass numerous levels of security, redundancy and resiliency. Utilizing industry-leading software, customization and patent-pending architecture, TAKOF has a group of applications that come together under an umbrella to provide a complete solution for the delivery industry. The flight systems cover all aspects of an unmanned aerial vehicle (UAV), from the operational component to the logistics integration. The operational platform, according to the company, includes "full operational guidance, route planning, geo-fencing, alerts, telemetry, maintenance, logs, full preventative maintenance scheduling and tracking." I saw a demo of this system at the company's office last year, and it was quite impressive. The company also tracks other aircraft with feeds from the relevant Flight Information Region . The Sparrow X1000 was the first drone that TAKOF developed, and was used for all its tests and certifications. It was the first cargo delivery drone of its kind to be accepted under the Transport Canada, Compliant UAS program in December 2017 . In June 2017 , TAKOF was the first drone delivery company to achieve BVLOS flights under Transport Canada's oversight. 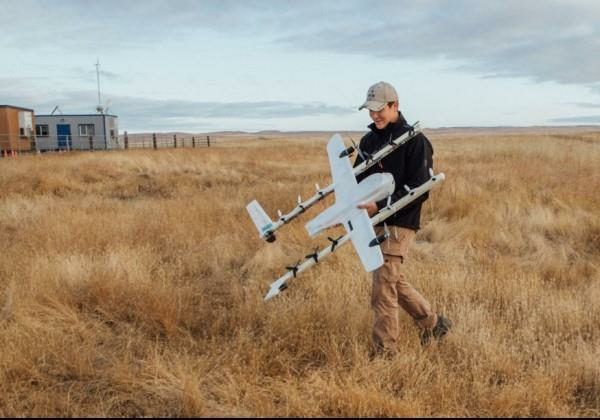 The systems that were tested predominantly include TAKOF's proprietary FLYTE management system, its avoidance technology and communications platform. During the flights,TAKOF's Mission Control Centre in Toronto, 2,500 kilometers (2,500 km) away, successfully monitored and record telemetry in real time for each flight. In addition, the "Robin X1400 will utilize a state-of-the-art dual payload deployment system, which would allow both static and tethered cargo deployments. DDC believes the tethered deployment system is the future for delivery in urban settings. With the tethered solution, the drone never lands. It simply deploys its payload by tether while hovering above at a height of approximately 100 feet in the air," the company states in a press release . TAKOF is leaping ahead of any competition with a new long-range and heavy-payload drone called the Falcon, with a lifting capability of 50 pounds of payload and a travel range of 60 km. TAKOF announced on Jan. 30, 2019 , that it has commenced test flights in southern Ontario that have been approved by Transport Canada. On Dec. 5, 2018 , TAKOF executed a commercial agreement with the Moose Cree First Nation to deploy its drone delivery technology platform with the Moose Cree First Nation communities of Moose Factory and Moosonee, Ontario, approximately 19 km south of James Bay. The company also states, "Wing is working with the Federal Aviation Administration (FAA) on the Low Altitude Authorization and Notification Capability (LAANC) system in the United States and with the Civil Aviation Safety Authority (CASA) in Australia to develop federated, industry-led solutions to safely integrate and manage drones in low-altitude airspace. Last May, the U.S. Department of Transportation selected Wing as one of ten teams to push the limits of drone technology in the Unmanned Aircraft Systems Integration Pilot Program ." Wing will also go commercial this year, with plans to launch its first European delivery service in Finland in the spring of 2019. Wing plans to start with a small service trial in the Helsinki area and hopes to expand as time progresses. The drones are quite small and can only carry 1.5 kilograms with a round-trip range of 20 kilometers. More detail can be found at www.wing.com .